This December 6th 2017, we held a Live, Interactive National K-8 Webcast in partnership with A Kids’ Guide to Canada where classrooms across Canada were able to meet students representing four diverse communities in Canada – Vancouver, BC; Gorrie, Ontario; Saskatoon, Saskatchewan; and Churchill, Manitoba. 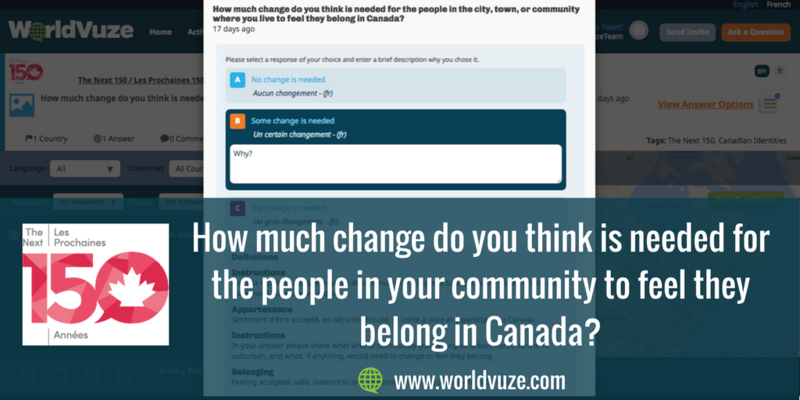 These four classrooms shared their thoughts on Canadian identity and belonging, reflecting on the Next 150 Discussion question on WorldVuze “How much change do you think is needed for the people in the city, town, or community where you live to feel they belong in Canada?”. If you were not able to see this webcast live, you can watch these incredibly insightful presentations with your class anytime in this webcast recording. Every student from the classes presenting responded to this question by choosing between three multiple choice options and then providing a written response to share “why”. First classroom presenters shared how their community responded to this question and then they compared their community to the rest of Canada, using the location filters and pie chart features built into WorldVuze, as you can see below. The results and insights students provided were fascinating! The WorldVuze Group at York House School in Vancouver, British Columbia shared how not all regions of Canada have the same perspectives and experiences when it comes to belonging in Canada. The Grade 7/8 class from Howick Central Public School in Gorrie, Ontario shared perspectives around diversity coming from a rural community in Canada. Students from St. Luke School in Saskatoon, Saskatchewan shared how mindsets about diversity and belonging can be learned and unlearned, “You can learn to discriminate, so you can learn NOT to discriminate”. Due to technical issues, we were not able to hear from the wonderful Grade 4/5 class from Duke of Marlborough School in Churchill, Manitoba. 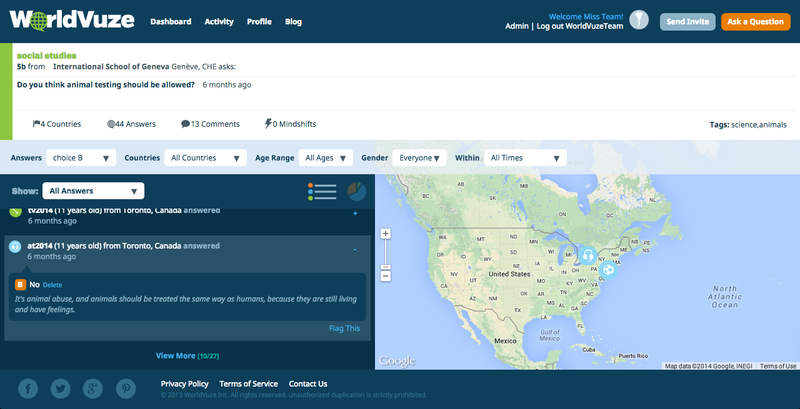 We welcome you to login to WorldVuze with your class and explore their perspectives and insights about belonging and other topics! Do you want your class to follow interact with the Canadian Identities activity showcased in the Kids Meet webcast? In this Canadian Identities Activity, which your class can do anytime, your students will be able to add their own perspectives and analyze perspectives on “belonging” first from their community’s perspective, then compare their community to other perspectives across Canada and/or internationally. WorldVuze Just Became Bilingual…and Other Exciting New Features! WorldVuze is now bilingual in French and English! This means not only can your students engage in discussions on WorldVuze in French, as well as English, but students can also join in bilingual discussions together. Watch this short video to walk you through these new and exciting features! Click on the drop down arrow located on the search window to reveal the language filter to find questions in French or English. 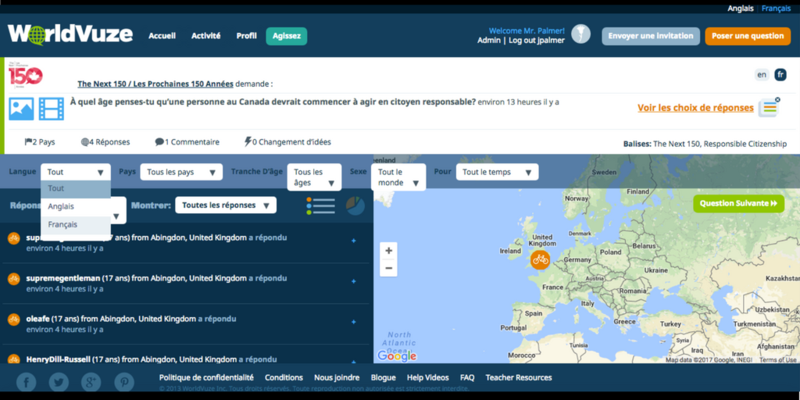 In addition to posting a question in either English or French, classrooms can now post their question in BOTH English AND French as a bilingual question. Your students can now engage in these new bilingual discussions, where they can view the question in both English and French with the EN/FR toggle. Students can answer questions in English or French. WorldVuze will detect which language the answer was written in. This means the same student can use WorldVuze as both a French and English speaker. You can now filter all answers to a question by language (English or French, for now) and read all the answers written in that language. New Ways to Find Discussion Challenge Questions and Other Discussions that Interest YOUR Class! We’ve redesigned the WorldVuze dashboard to make it easier for you to find discussions that interest YOUR class, including featured discussion challenges that are happening right now. Watch for yourself how finding meaningful dialogue just got easier! 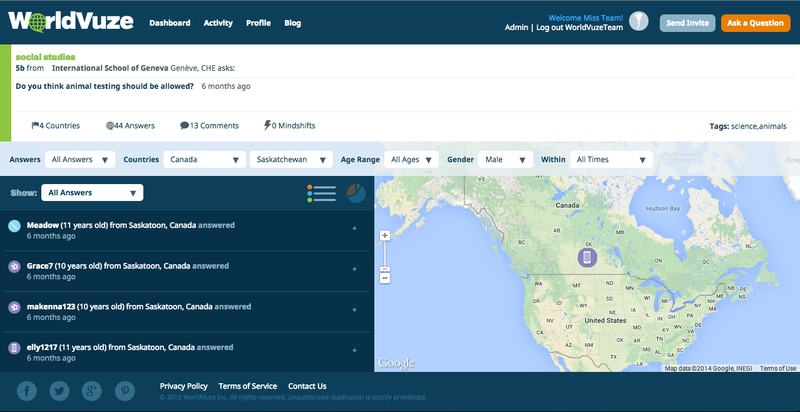 On the top left corner of the dashboard you will find circle icons which are quick links to featured questions. Clicking on one of these icons will take a student directly to that featured question. Currently there are five red icons, each representing one category of the Next 150 discussion questions. Click on the blue drop down arrow, located to the right of the red icons, to see an overview of ALL featured discussion questions, as well as other ‘Questions of the Week’ highlighting classroom questions on a range of topics. In the drop down, under Featured Discussion Questions, you will see tabs across the top representing each category. Clicking on one of the featured category tabs, for example “Sustainable Future”, , will allow you to see all the featured questions from that category. Clicking on one of the question image boxes will then take you directly to that specific question. Once your students have answered a question, they can click on the green “Next Question” tab, which will take them to the next question in this topic without having to leave the page. This is a way they can easily explore and answer the rest of the questions from that same category. Once they’ve finished exploring questions from this category, the “Next Question” button will change to “Go Back”. 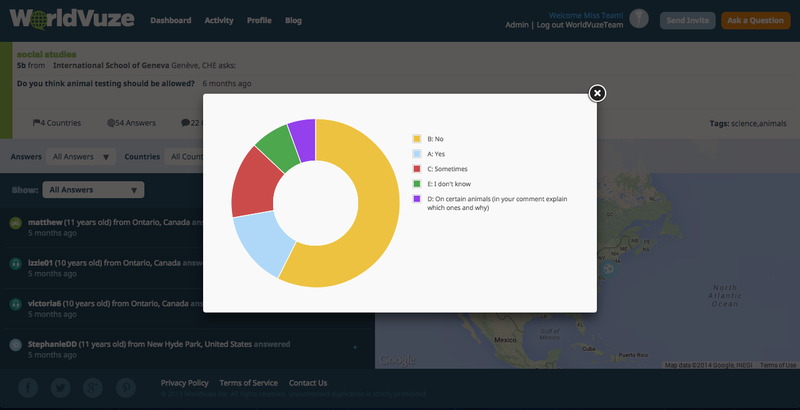 They can then click on the “Go Back” button, “Home” or the WorldVuze icon to take them back to the dashboard, where they can share their perspectives on more discussion topics! Come meet students representing provinces across Canada in this Live, Interactive National K-8 Webcast as they share their thoughts on Canadian Identity and belonging, reflecting on the Next 150 Discussions on WorldVuze! Register your class to watch and actively participate in live audience activities. This webcast is a partnership between A Kids’ Guide to Canada (AKGTC) and WorldVuze as part of a series of regular AKGTC Kids Meet national webcasts. During the live webcast, students representing provinces across the country will be sharing their thoughts on what belonging means to young people from their community compared to the rest of Canada. Your class can play an active role by sharing their perspectives on belonging from their own community by answering the following Next 150 discussion question on WorldVuze below, before November 21st. 3. Share their Perspectives and submit their answers! Once your students click on the question, it will take them directly to a pop-up where they can type and share their perspective on that question. Do you want your class to follow along and interact with the Canadian Identities activity showcased in the Kids Meet webcast? In this Canadian Identities Activity, which your class can do prior to the webcast, your students will add their own perspectives and analyze perspectives on “belonging in Canada” first from their community’s perspective, then compare their community to other perspectives across Canada. The Next 150 / Les Prochaines 150 Années is a powerful opportunity for thousands of elementary, middle, and secondary students from diverse communities across the country to come together to help shape Canada’s future. Starting Monday, September 18th until November 30th, 2017, your students can join the national Next 150 discussion on WorldVuze to share their vision for the Canada young people want in the next 150 years and as a result create a blueprint to help them and future generations get us there. As a result, this collective Next 150 vision will be posted publicly by WorldVuze as an infographic and report and shared with the media, Canadian Ministries and decision makers so the voices of Canadian youth will be heard! Click here for a comprehensive guide to the Next 150 discussions, including everything you see below and more! 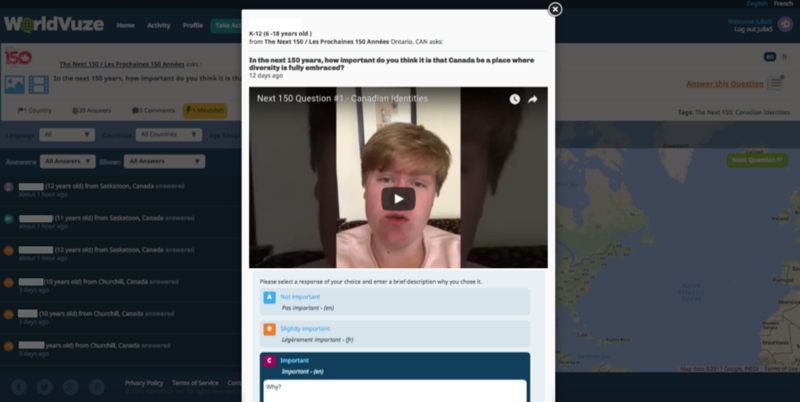 Now your students will have the opportunity to join hundreds of discussions with K-12 students across Canada and around the world in the safe WorldVuze environment! See here how we make sure WorldVuze is a safe environment for K-12 students and teachers only, from validating all teachers on the platform, to our student privacy measures, profanity filter, and flagging system. Have your students log back into WorldVuze (in class or at home) and choose one of the Next 150 discussion topics. There are 4-5 discussion questions under each Next 150 topic for your students to answer. As a teacher, you can keep track of all of your own students’ answers in your teacher Activity feed. 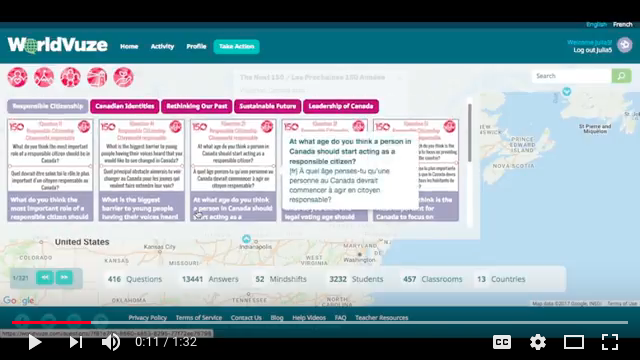 Check out a preview of all of the Next 150 discussion questions in English and French. Deepen the learning experience for your students in the Next 150 discussions by integrating these Next 150 activities and background resources, available in both English and French. Share your vision of what you think should be expected of a ‘responsible’ citizen in Canada and what rights they should expect to have in the Next 150 years. Share your vision of what it should mean for people of all cultures and communities (urban, rural, Indigenous, northern, suburban, Francophone, Anglophone) in Canada to feel they belong and are represented in the next 150. Share your vision of whether anything needs to change in the way we learn about Canadian history in school and in the media and the value of learning from the past in the next 150 years. Share your vision of the kind of changes people and communities in Canada should be making to become more sustainable and what Canada’s contribution as a nation should be towards a more sustainable world in the next 150 years. Share your vision of what role Canada should take as a leader in the world, Canada’s responsibility to address international challenges, and how Canada should prepare young people to contribute as leaders in the world in the next 150 years. We have listened and heard from many educators that you would like a way to connect and collaborate together with other classrooms that are on WorldVuze. We’ve created a WorldVuze Teacher Google Community where you can do just that! It’s a private community, which only teachers who have been validated on WorldVuze can join. Click here to join now! If you’re a K-12 educator and not already registered to WorldVuze, you can sign up to WorldVuze and join the Google Community once you’ve been validated by us. WorldVuze will always be free for K-12 teachers and students anywhere in the world. On the WorldVuze Teachers Google Community, you can post initiatives you would like to collaborate on with other WorldVuze classrooms or ideas for how you’d like to go beyond the discussions on WorldVuze. By signing up to WorldVuze, you are not automatically part of this Google teacher community and will need to opt-in here to participate. Check back into the WorldVuze Teachers Google Community periodically for new collaboration opportunities. We will also send updates through our monthly teacher e-blasts highlighting what you are sharing! This community is for you, so please share your ideas if there are ways we can make this community even better for you by emailing us at info@worldvuze.com. The likelihood that today’s careers will survive in the future, alongside driverless cars and Artificial Intelligence, is slim to none (see the likelihood of different careers to survive in the BBC article Will a robot take your job?). Instead, we’re more likely to see an increase in entrepreneurship and careers that are more technologically-driven and global in nature. In their lifetimes, our students will also face the potential escalation of massive and complex social and environmental challenges, from climate change to epidemics, operating on an international scale. Respectful of and empathetic to different cultures and seeks to understand different points of view. This set of skills, often grouped as “21st century skills” or by Michael Fullan as the 6 C’s, encompass competencies from critical thinking, creativity, collaboration, citizenship, communication, to character. We built our WorldVuze technology specifically for the K-12 education community to create opportunities for these important skills and competencies to be practiced and applied in an authentic and safe environment. We also understand that any technology must be rooted in and scaffolded by strong pedagogy in order to successfully support truly powerful and transformative learning. Through our professional development training workshops, educators can learn how to use our technology to regularly integrate powerful global learning experiences into their curriculum and support their students in their development as critical, creative and collaborative global citizens. This July 4 and 5th 2016, we are partnering with Dr. Garfield Gini-Newman from the Critical Thinking Consortium and Amanda Humphreys, classroom educator from the Bishop Strachan School, to offer a 2-day workshop at the BSS Summer Symposium in Toronto. We invite you to bring WorldVuze PD to your school or event by choosing from our Full-Day and Half-Day workshop options or by working with our team to design a custom PD workshop, which can be tailored to your group by grade and subject area (see our list of PD units below). For more information or to design and schedule your own workshop, please contact Julia Coburn at julia@worldvuze.com. Learn how to use an innovative framework for asking powerful, critical thinking questions and practice applying it hands-on. Gain strategies for developing critical thinking questions collaboratively with your students that your class can pose to a global community. Unpack a framework for facilitating thoughtful inter-cultural communicators. Using real-life posts from students on WorldVuze, practice providing helpful feedback to guide your students to share more thoughtful answers, comments, and “mindshifts” in an authentic global learning environment of their peers. Communicating to a diverse global community. Explore global citizenship through multiple lenses and reflect on the impact of these different approaches. Uncover the breadth of what a global citizen can look like and develop a model for the kind of global learning experiences you hope to foster in your own classroom. Become a WorldVuze expert! In this hands-on session we will help you navigate all the regular features of the platform (signing up, creating a class, posting a question, student activity assessment) as well as provide you with valuable tips to enable you and your students to make the most of this innovative and unique tool. For example, accessing student reports, posting video questions, exploring perspectives by using multiple filters and pie charts, creating engaging class profiles and how to take action on real-world issues. Miss Murray’s Class “Talks” the Better than Before Challenge! When compared to 31 of the world’s wealthiest countries, Canada’s children are among the least satisfied with their lives, ranking 25th according to UNICEF’s Report Card 13: Fairness for Children. Canadian child and youth well-being is on the decline. “UNICEF Canada is committed to implementing the rights contained in the Convention on the Rights of the Child, and that includes children’s right to be heard. We need to hear from young people to really understand their concerns and their thoughts on how to make Canada a better place for them”, says UNICEF Canada Policy Officer, Stacia Sahi. We joined Miss Murray’s Grade 8 class at Crescent School last week, who shared their thoughts on UNICEF Canada’s Better than Before Challenge and how classrooms across the country can join from now until the end of May 2016. K-12 teachers can sign their class up for free on WorldVuze where their students can safely engage in this and other discussions with students across Canada and around the world. By sharing their perspectives on the 5 Better Before Challenge questions on WorldVuze (tagged UNICEF2016), students can share what is important to their well-being and how they think Canada can be a better place for children and youth to live. This is a chance for students to use their voice to make a real-world impact and help advocate for change to improve well-being for children and youth in Canada. Learn how your class can join the Better than Before Challenge this May 2016 and share the challenge with two other classrooms you know to engage in this exciting dialogue! NEW Features – Video Questions, Class Profiles, and More! WorldVuze just got more engaging! This month we are introducing new features that will allow classrooms to feel more deeply connected to one another by offering new mediums and opportunities to engage with the world. Ask a video question as a class or use a video to inspire discussion. Start by asking a question as you normally would by typing out your question and multiple choice options in the question field. Turn it into a video question, using YouTube or Vimeo, by finding the video you want and using the proper embed format. How might pictures or images be interpreted from different perspectives? You can explore this new medium for discussion by posting your own picture questions! Simply find your image and add it to your next question on WorldVuze. Learn more about the class behind the question by adding your own class profile. Add a class picture and class description that students and teachers around the world can see by editing your class, under your profile tab. See class profiles of others by clicking on the class name or class profile icon next to their question, such as the Grade 6 Class below. New to WorldVuze? Check out our 5 Steps to Get Your Class Started on WorldVuze blog, our case studies, or demo videos page. Already using WorldVuze, but interested in opportunities to further foster 21st century competencies in your students through inquiry using the technology? Consider joining one of our training sessions near you or bring WorldVuze trainers to your school. Grade 7 student, Carly, shares how WorldVuze works from a student perspective and tells a story of how she used it as a tool to explore first-hand perspectives on a topic she was curious about. Watch as Carly independently walks through the process of inquiry from beginning to end, driven by her own interests. This February 17th 2016, TFO, a go-to resource for educational and cultural content in French in Ontario and internationally is holding its third annual Les Tablettistes conference at Glendon College in Toronto. Les Tablettistes is a bilingual forum for discussion and exchange of ideas that brings together leaders in education, media, and tech to explore the challenges and opportunities for the future in a digital world. This includes an opening address from Canada’s former Prime Minister from 2003 to 2006, the Right Honourable Paul Martin; Student Rights Ambassador for Student Voice, Erik Martin; and Catherine Cano, Executive Director News Programs and Special Events CBC/Radio-Canada. This jam packed event investigates the cross-section of innovation and education. WorldVuze, in partnership with TFO’s Les Tablettistes and The Wonderment want to bring the student perspective to the table from students across Canada and around the world! Student perspectives shared by you throughout the month of January 2016 on WorldVuze and The Wonderment will be featured at Les Tablettistes conference in posters and a special video that will be seen by all attendees. Here’s a chance for student voice to be front and centre in shaping the future of education. How do you join the conversation? New to WorldVuze? Check out here how to get your class started on WorldVuze in 5 easy steps. Once your class has joined WorldVuze, your students can safely share their perspectives on these five special Les Tablettistes questions below. Type the question you want to answer or the “TFO” or “Les Tablettistes” question tag in the search bar for easy access to the Les Tablettistes questions. You can also login to WorldVuze, click on the question links below and be taken directly to the question you want! All languages are welcome. We encourage you to answer the question in a language that you feel most comfortable writing in! 1) What helps you learn best at school? 2) If you could design the school of the future, what would you include to make it better than today’s schools? 3) What are the most important skills you think you should be learning at school? 4) How different do you think school is now from when your parents or grandparents went to school? 5) How well do you think your education is preparing you for your future? Do you ever wonder how other people see the world? Sometimes it can be hard to imagine. Every person carries their own worldview, a collection of personal, cultural and societal influences, that shape how they see the world. These world views, along with social norms, are what drive the decisions that we make, big or small. The problem is, when we carry these world views with us, they act as a shadow. We do not feel they are there and they accompany us wherever we go. Often we do not even realize it is there and because of this, it can be challenging to comprehend the many alternative world views that exist. World views are also not static. One individual’s worldview can be similar or vary widely from others across the world or even within their own community and classroom, but it is also highly dependent on the topic at hand. As a student, you may share the same worldview with your classmates on many topics, but at the same time, have more in common with peers on the other side of the world on another topic. They can also change with new information, meeting new people, and exposure to novel experiences or events. Empathy is an important process, to try to feel what it is like to be in another person’s shoes. As a class on WorldVuze, you can ask questions to learn about the spectrum of views that students locally and around the world have on any topic in a safe environment. This means, that when your class is learning about global issues, whether it is climate change, human rights, science and technology, or education, you can step outside of yourself and try to have a better understanding of how other people are thinking and why. This provides a base for deep and authentic, real-world learning experiences. Now, you can take this even one step further, a step beyond empathy. Instead of just putting yourself in another person’s shoes, now you have the opportunity to reflect on your own world view, the way a person sees it from a different point of view. It is hard to examine your own “shadow”, but much easier for someone to shine light on it, if they are coming from a different angle. No Name-Calling Week: What does it mean to keep your school safe? This week (Jan 19th-23rd) is No Name Calling Week. This is a week to spotlight no-name calling and anti-bullying. It is a time to think of how your school can become a safe place for everyone. Child Helpline International (CHI) is a “global network of 192 child helplines in 145 countries”. CHI reported that 28 million children and youth internationally contacted child helplines between 2012 to 2013 where they commonly requested assistance, council, or referral on abuse and violence (29%); psycho-social mental health (14%); peer relationships (125); family relationships (11%); sexuality and sexual awareness (9%); and school-related matters (5%). Since as early as 1999, bullying unfortunately has extended into cyberspace and is becoming a growing phenomenon due to increased access to ICT and use of social networking sites. Cyberbullying can cross mediums from text message, email, blogs, and social media. According to PREVNet (Promoting Relationships & Eliminating Violence Network) 1 in 3 Canadian youth reported being cyberbullied and 78% believe not enough is being done to stop bullying in their community. Students need to learn how to conduct themselves ethically both on and offline and as a community we must be prepared to step in to stop it in its’ tracks. Extend conversations and activities happening at your school and find out what is happening at other schools locally and around the world by posting questions and engaging in meaningful conversations on WorldVuze. What is the experience at other schools with this issue? How are schools addressing bullying and do students believe the approach is effective? What do students in different areas of the world believe are the root causes of bullying? Where do students see bullying happen most frequently? Looking for Practical Ways to Integrate WorldVuze into Your Curriculum? We want to help! There are many creative ways you can pull WorldVuze into your classroom to add real-world context, a deeper global understanding, and provide more enriching learning experiences for your students. The exercise of students developing a provoking question, communicating their own opinion in a cross-cultural environment, and processing/ interpreting/ analyzing multiple and diverse perspectives shared by other students around the world on WorldVuze has significant potential for building much needed higher order thinking skills and 21st century competencies (i.e. critical thinking, cross-cultural communication, collaboration, citizenship). We believe the greatest potential is when the tool is used through an inquiry-based and student-centred approach. Email your questions to us at info@worldvuze.com. A skilled educator will share suggestions and advice with you. Find out how other classrooms have been using WorldVuze on our Case Studies page. Stay tuned for many more entries to come! If you would like more hands-on support, you may consider a workshop at your school. Email us at info@worldvuze.com to request more information. Workshops will be available starting in March 2015. Lastly, in the future, we would also like to create an entire Teacher Community section of the WorldVuze platform to support peer-to-peer learning, sharing ideas and resources, and networking. An article in the Guardian today “Why does diversity in the media sector matter?” discussed the importance of diversity in forming and reporting on the news, bringing together news agencies from the BBC, the Guardian, GNM, and Knight-Mozilla. They note that diversity goes beyond looking or sounding different, but involves many factors coming together (age, background, life experiences, peers) that influence the “diversity of thought”. On WorldVuze classrooms have the opportunity to ask questions that matter to them. Sometimes these questions are formed from a book you are reading or a discussion that has stemmed from the unit you are working on in class. Another way you can engage your students in meaningful dialogue on important local and global issues is by using the news as a starting point. What role do you think zoos should play in conserving wildlife? What do you think is the responsibility of the “average person” to protect endangered or threatened species? What support do you think conservationists need to truly protect endangered species, such as the Northern white rhino? The process of developing a good question that can inspire a meaningful and engaging discussion can be challenging, but is one of the most important parts of this learning process. Set criteria with your class about what a “good question” looks like for WorldVuze (one important criteria you should strongly consider is that the question seeks opinion or perspective, not fact). The value of being exposed to a diversity of perspectives is immense. It is central to developing fundamental 21st century competencies such as critical thinking and collaboration. It helps break down barriers and stereotypes by going beyond any one isolated point of view representing a place, such as a country or a city. By exploring multiple points of view on a regular basis, it not only creates an opportunity to consider new perspectives and ways of thinking, but can also alter our perception of each other. Diversity helps to inspire innovation and creativity. In fact, in the September 2014 issue of Scientific American focused on Diversity from a scientific perspective in a series of articles. One article, by Fred Guterl, “Diversity in Science: Why it is Essential for Excellence” found that diversity relates to the quality and effectiveness of teams as it makes us address our unconscious biases and tends to make people prepare and critically analyze their own point of view more thoroughly as a result. The article goes on to share the gravity of being exposed to a diversity of thought in saying: “Scientists pride themselves on their objectivity, but personal experience and point of view have a lot to do with what questions get asked in the first place and how researchers go about answering them. The people in science and engineering are driving the world’s most vital engine of prosperity and new ideas. Who are they?”. If you take this concept beyond science and apply this phenomenon to all fields (i.e. environmental management, international development, city planning, etc. ), you can only imagine the potential impact it can have on how we may solve all of our most pressing problems. This Monday, we co-presented a session with Jennifer D. Klein from PRINCIPLED Learning Strategies and the World Leadership School at the Global Education Conference 2014. The session, “Using Multiple Student Perspectives to Break the Single Story” discussed three underlying principles that helped form the WorldVuze experience and our philosophies toward global education. If you were not able to make it to the session, do not fret, you can watch it on your own time here! You can also learn more about Global Education at this wonderful and free online conference here. It will be running all week until Friday, November 21st. We are thrilled to be joining the Global Education Conference 2014 this year. Join us on Monday, November 17th at 10pm EST in our conference session “Using Multiple Student Perspectives to Break the Single Story” that we are co-presenting with Jennifer D. Klein, the founder of PRINCIPLED Learning Solutions and Director of Professional Development at World Leadership School. During the session, we will discuss the underlying principles behind the WorldVuze technology and their implications to global education. Find out how you can make learning about complex local and global topics engaging and relatable for students, bringing humanity and empowering the individual, while not losing sight of the big picture and the collective. Themes discussed in this presentation include: uncovering bias; student centred learning, student voice, equitable global dialogue, and inquiry based learning. We have created WorldVuze to present information in a way that will allow you and your students to easily sort and find patterns in answers to questions and dig deeper to understand why they and their peers are thinking the way they do. Take a question asked by a Grade 5 class from the International School of Geneva in Geneva, Switzerland: Do you think animal testing should be allowed? So far, 44 students from 4 countries have answered this question. There are many ways your students can sort through these answers. 2) Students can filter the answers by how students have answered the question. For example, first by looking at the answers of students who said “yes” (choice a); then looking at the answers of students who said “no” (choice b); and so on. Sample question: What were some common reasons cited by students when students answered “yes”? How about “no”? 3) Then students can further filter answers by country, region, age, gender, and time. For example, you may want your students to compare answers between the “United States” and “Sweden”, or from students in one province of Canada “Ontario” to another “Saskatchewan”. Students can also use the pie chart, which adjusts to the filters they have set, to quickly capture a visual comparison. Sample question: What are the similarities and differences between answers coming from students in Sweden compared to the United States? You can ask your students questions about the quality of the information they are receiving. How many answers will you need to find a real pattern? You can ask students to reflect on the answers they read and examine whether any of the answers had changed the way they are thinking about the topic or the way they thought other students would have responded. This is what we call a “mindshift”. They can then share their mindshifts, if they have had any, on the question page itself! There are so many examples of classroom lessons that we will continue to share, but we also want to hear from you! What are some creative ways that you are using WorldVuze in your class? Why do students think WorldVuze matters? WorldVuze wouldn’t matter if students didn’t care. Before we began our pilot in April, over 300 students answered a pre-pilot survey where 92% said they are more interested in school when they “care about what they are learning”. Young people will need to address complex and multi-layered global challenges in their life time – the environment, politics, health, food, energy, the economy. For the same reason that these issues are complex and multi-layered, they are easy for people to feel disconnected to, to feel overwhelmed in their immensity. What we found out is this. Students are engaged when they are able to share their own opinion. Students are excited by questions that challenge their thinking. Students care about what other young people have to say. By creating an environment where students have an outlet to engage in meaningful global dialogue with other students their own age, students develop a deeper interest in these challenging and complex topics. At the end of the pilot in June, 92% of students shared that WorldVuze helped them care more about what they are learning. It is this kind of fascination and curiosity we believe will be needed in our leaders who will ultimately tackle these challenges and effectively and collaboratively address them. What Image Comes to Your Head When You Hear “Sierra Leone”? Many students who had responded were not aware of the country, while others piped in. Over a short period of time working with Hindo, I came to know a person committed to education and a person determined to empower his students to bring change to the Bumpe community, the country, and the world. The dream for the school in April 2014 was to have their own computer centre. With this technology, access to resources could be expedited and students and teachers would have a greater connection to the world at their fingertips. Hindo had sent a document outlining his yearly plan to cover a range of topics with his students from: careers, technology, education, health, peace, environment, agriculture, entrepreneurship, and law. So how were the students in his class engaged on WorldVuze without the computer centre you might ask? It was through the determination of Hindo who worked with his students and on his own time came home and used his own resources to communicate with me to share his students’ questions. Prior to working with us, Hindo has had a long commitment toward global education, working with TakingITGlobal. If you look up Sierra Leone in Google now, you will be hard pressed to see anything more than news about the Ebola epidemic. Without other connections to this place, will this become the new face of Sierra Leone? In a recent article posted by the Guardian, it has been cited that there are 20 deaths per day due to Ebola in the country. It is hard to truly grasp what these statistics mean. Where do you find out how people living through this experience are thinking and feeling about it? In order to learn more, we need to first support each other in these most pressing times. If you were in this position instead, I truly believe that a person like Hindo would help you. He and his community are working tirelessly to ensure that the deadly Ebola epidemic does not claim any more lives than it already has. Hindo and his students are setting up opportunities to connect to their classrooms. If you are interested in learning with them, please find out more by reading Jennifer Klein’s article, Ebola in Bumpe: Connect Your School to Real Grassroots Action. Most importantly, please show your support by donating to their lifesaving educational and sanitation initiatives here! As a global community, let’s do our part to stop this epidemic. Our hope is that soon, when we bring up Sierra Leone, it will be a new topic of conversation. ‘Not So Silent Auction’ – Raises Voices for WorldVuze! Last evening we held our first ever ‘Not So Silent’ Auction to “raise” voices on WorldVuze and are happy to say it was a great success with over 600 voices raised! A few thank you’s are in order. First, thank you to all who came out to the event and to so many others who did their part to chip in. Thank you to our in-kind donors for the evening: Blyss Salon, the National Ballet of Canada, Sweets from the Earth, David’s Tea, the Air Canada enRoute Film Festival, DeSerres, Sushi Kai, Rosedale Diner, The Toronto International Film Festival, Absolute Comedy, Starbucks, imagineNATIVE Film Festival, Reel Asian International Film Festival, Grazie Restorante, What a Bagel, Second Cup and Sweet Sensations Candy Buffet. Thanks also to Scallywags for hosting our event! This is the first step in adding more student voices on WorldVuze. WorldVuze is a place where every voice matters and every voice is equal, bringing together students from different backgrounds all over the world. This is important as multiple perspectives are critical to breaking down assumptions and for students to gain a deeper understanding of themselves, each other, and the world around them. We can only imagine what would happen if students had exposure to multiple and diverse points of view on a regular basis, especially starting at a young age! For this reason, it is critical for the platform to be free for teachers and their students to use. Since most teachers have limited budgets, having to pay for the site would prohibit many from using it, limiting the number and diversity of our student community. This goes beyond simply limiting diversity between countries, but even within countries, cities and towns. The real power lies in bringing the voices of young people together that may not have otherwise had the chance to encounter one another. That is why we need your help! Help students to have a voice on WorldVuze. For every $5, one more student can join. The more voices, the more perspectives that can help each child shape their understanding of the world. Stay tuned for our upcoming IndieGoGo crowdfunding campaign where you too can help students around the world have a voice and learn together! Last spring we joined Nelson Mandela Public School in Toronto, Canada on a class visit and were able to witness an exercise in students uncovering stereotypes before our very eyes. The class had previously been investigating the topics of “child labour” and “racism” and wanted to extend their learning by understanding how other students in different countries thought about these topics. Before they looked at the answers from other students, these Grade 6 students were asked to “predict” what they thought students from different countries who had answered the question had said. How did what students from different countries say either confirm or disprove their assumptions? Keeping in mind the limited number of answers contributed in our pilot (of 600). This investigation led to a deep discussion. Students had come into the experience with an understanding that others can form “stereotypes” of them, but were beginning to uncover their own assumptions about the world and ask questions about their “mental models” of others. This exercise in uncovering assumptions can be repeated with your own class questions and when delving into questions posted by others that interest your class! Before creating WorldVuze, we facilitated international classroom partnerships for four years between schools in Tanzania and Canada through our Tanzanian NGO, Cross Community Connect. In the process, we came across many obstacles with the tools we were using, ranging from time consuming facilitation, time zone differences, technical issues, and a lack of sustained meaningful dialogue. These same concerns were echoed by hundreds of teachers that we talked to over the years. In the end, our greatest concern of facilitating one-to-one partnerships was exposing students to a “narrow” view of any place. Creating a connection between two classrooms, such as one class in Tanzania and one class in Canada, in isolation had the potential to reinforce stereotypes and give students a false confidence that by knowing these few perspectives, they understood a whole country or continent! An example of this happening was when we asked grade 3 students in Toronto, Canada to describe their “biggest problem” as if they were a student from Uvinza, Tanzania (a village in Western Tanzania). The response was overwhelmingly, “water issues”. In fact, these grade 3 students were so confident the major problem in Uvinza was water issues they moved on to brainstorm how they would solve this problem and were prepared to ship the other class water bottles. This confirmed just how critical it was to have a place where students could explore a diversity of perspectives from any one place, on any topic. Ultimately, we hope to see millions of students locally and around the world sharing perspectives, breaking down barriers between individuals from diverse geographic, socioeconomic, and cultural backgrounds and in the process, help develop a generation of young people that are open to considering and understanding multiple points of view. We believe this is critical to forming meaningful and effective change. © 2016 WorldVuze Education All rights reserved. Unauthorized duplication is strictly prohibited.